Being the shortest par 4 on the course this hole offers probably the easiest of birdie opportunities where a good strike from the tee should afford an uncomplicated approach into the green. 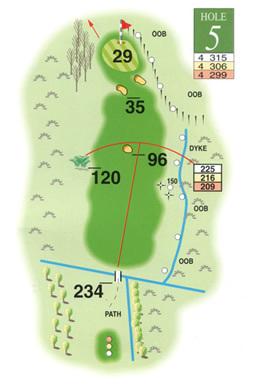 The key to the successful drive is to avoid the central fairway bunker though any second shot should take heed of the deceptive crosswind as the tee area is protected by trees. There are some intricate slopes and breaks on the green to consider but little recovery room behind for the aggressive approach. A good chance of a par at least.